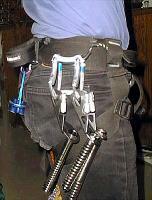 Removing an ice screw racked on a dangling carabiner with one gloved hand is difficult, so several companies sell clips that can be immobilised on your harness to make unracking easier (eg the Black Diamond Ice Clipper). However, if those are not easily available to you, you can splint two carabiners together with cable ties in the following way. Assembly time : 5 mins. Fold the cable ties in two and thread through the plastic tubes so that a loop pokes out of one end. Thread these loops on to one of the carabiners so that one is near the hinge and the others are at each end of the spine. Now make the construction symmetric by closing the cable ties to make loops around the second carabiner at their other ends, and you are done. Clip both carabiners on to a gear loop on your harness, and by pushing the hangers of your ice screws against the gates you can easily rack and unrack with one mitted hand. I tried using several materials to stop snow balling up under my crampons. Shiny plastic from ice-cream containers seemed an obvious start, but the attaching wire cut through too easily, and there was the same problem with bicycle inner-tube rubber, which also didn't last long on mixed terrain. The best choice seemed to be rubber from a tractor inner tube (do some container diving near your favorite tyre shop). This is thick and strong, but not too heavy. If you cut it slightly oversized, it will bow out when mounted, and thus flex when touched, which will help to actively displace the snow. I attached the front rubber plate with three pieces of wire, and the back one with two. a) If you make the bottom of the hook flat, or better still slightly convex, you can use it to push a double strand of rope as well to pull. b) Make it as long as your longest screw, and narrow enough that you can also use it to clear stubborn ice cores. d) While you're at it, add a piece of dowel to use as a handle on ice screws that don't have express knobs. Want to find out what's so great about monopoints without paying $60 for a conversion kit ? 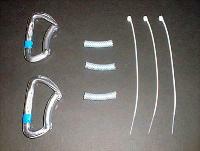 Then try this conversion that works for Grivel Rambos and similar crampons. Assembly time : 20 mins. The idea is to make spacers from the steel tubing so that you can move one of your existing points near to the centre. A little closer to the big toe turns out to be more stable than dead centre. Measure the length of the existing spacer between the dual points (in the Rambo's case 44mm) and add the width of the point you will remove (4mm). I then divided this 48mm into 20mm and 28mm sections, and made 6 spacers of each length. Although there are only 2 spacers on the original crampon, you will need to replace the short bolts joining the back of the points to the frame with a new 55mm bolt and another pair of spacers. Now simply reassemble with a spacer on each side of one point, remembering to match up the long and short spacers such that you get a left and right crampon. Simple huh ? Now send me half of the $55 you just saved.